I’m back! I haven’t been able to post for a while because I haven’t been bringing bento to work. I was undergoing sleep adjustments to a slight change in schedule and thus I haven’t been able to wake up early enough to prepare baon, or even to remember to transfer some of my food stash from the freezer to the fridge to defrost overnight. Anyway! 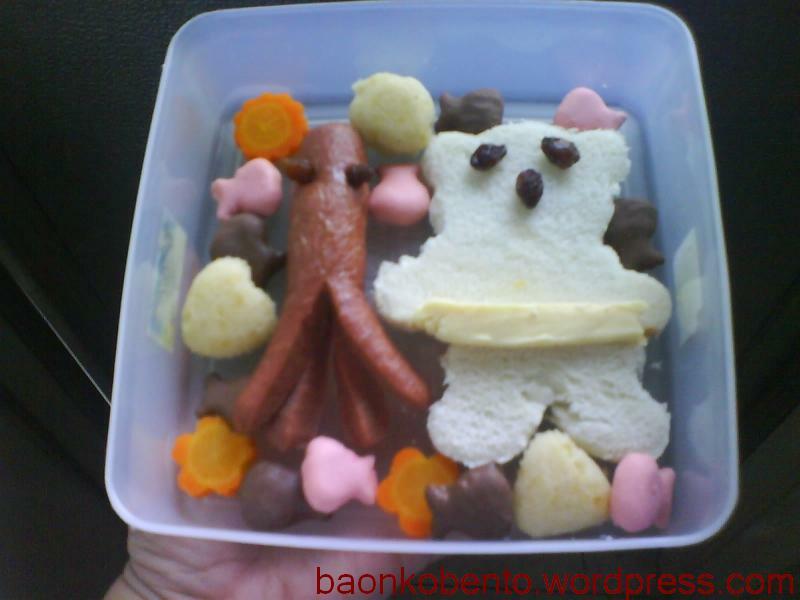 I’m here with a JustBento-inspired bento. 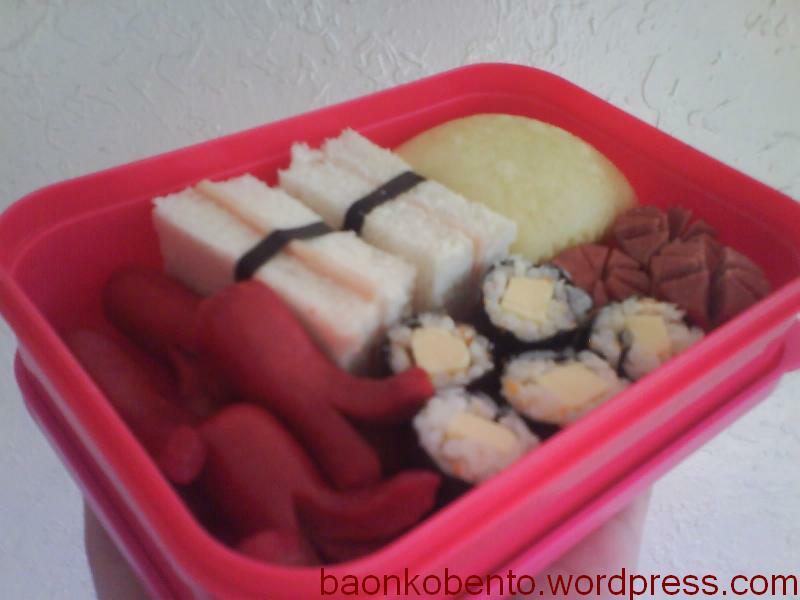 JustBento is a website by the amazing Maki, and is one of my main sources of inspiration and lessons for cooking and bento-making. She’s also the author of JustHungry, which I’ve linked to before for tamagoyaki and soba dipping sauce. 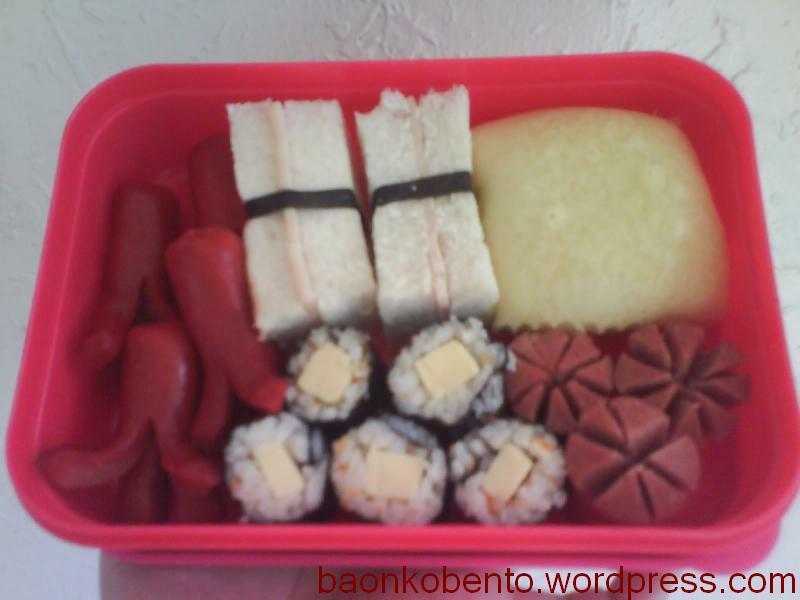 This bento contains three of the recipes found in JustBento and JustHungry. 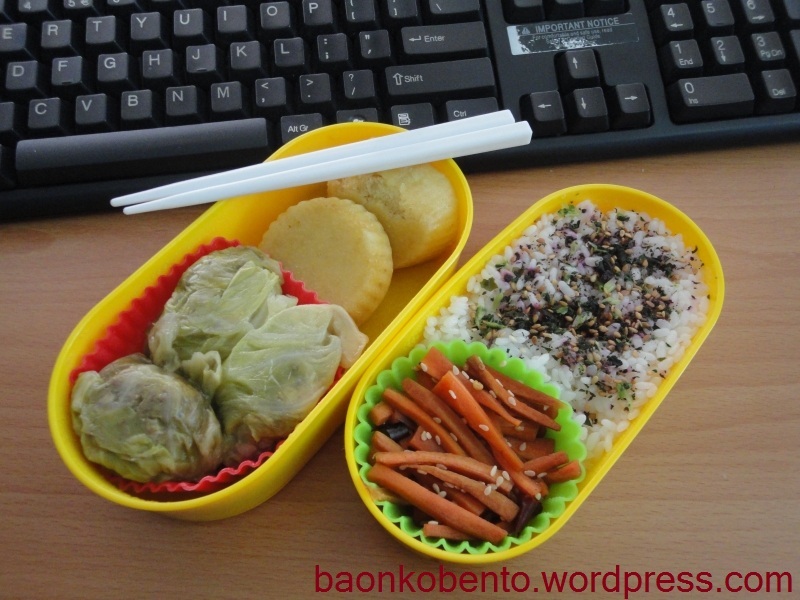 The star of this bento is the bento-sized cabbage rolls. 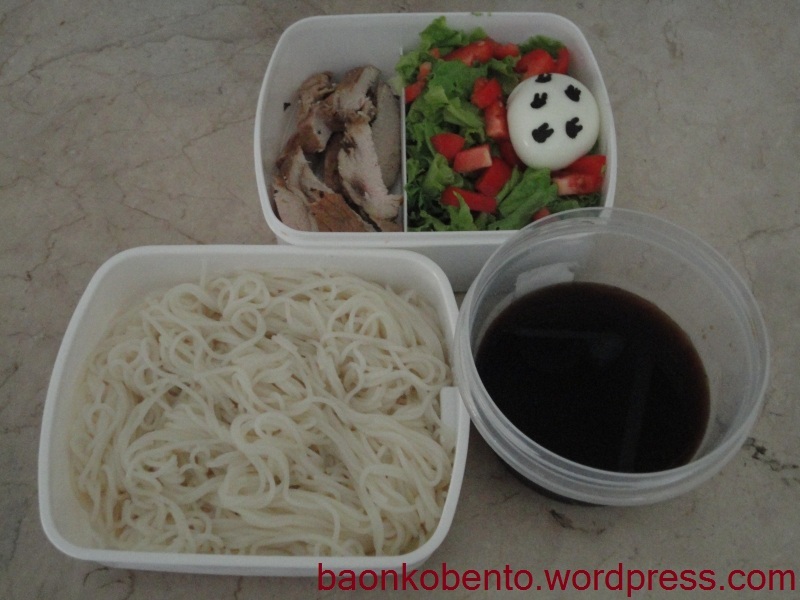 I like this recipe very much because it’s very easy to make, very tasty and yet healthy, and makes use of a rice cooker. It’s also perfectly sized! As you can see here, one serving (3 rolls) can fit right into a large silicon cup. It also keeps pretty well in the freezer so it can last for some time. The recipe also describes how to properly freeze the cabbage rolls. 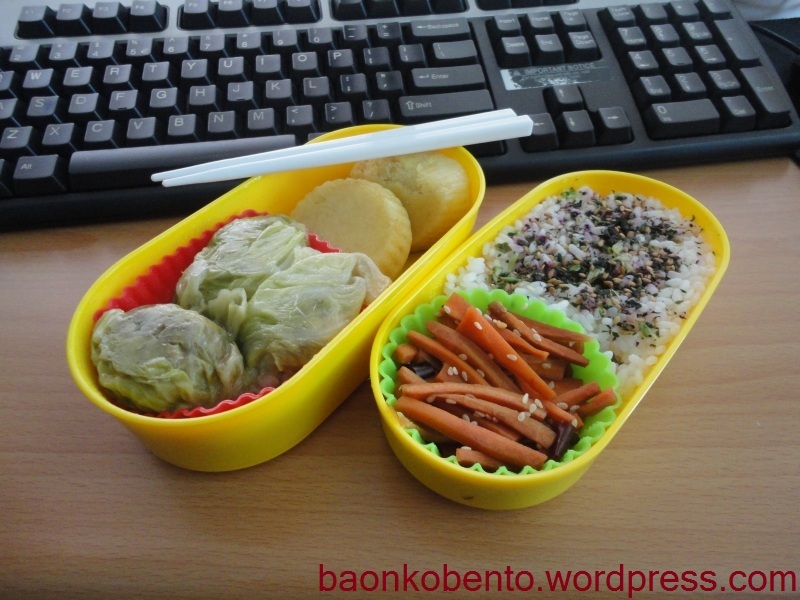 Beside my cabbage rolls are two mushipan which I have written about before. My recipe is based mainly from this recipe from JustHungry with the following modifications: 1) I use around 1 cup of sugar more than the recipe calls for, because I like it sweeter, and I’m working my way to find the right mix so The Man can enjoy it too. He has a sweet tooth. 2) I omitted the raisins because I don’t like raisins. 3) I use apple juice instead of brandy, a prescribed substitite. Even though I omitted the raisins, I still put in the apple juice for added flavor. 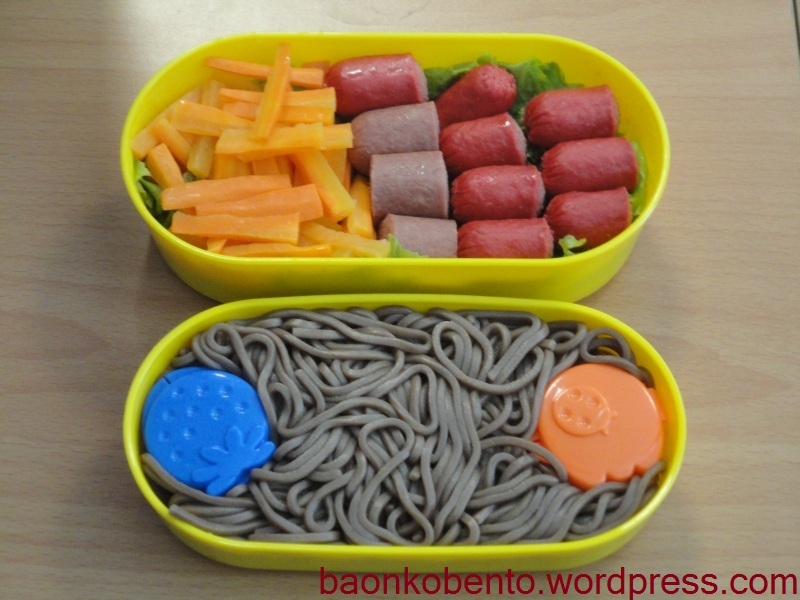 And 4) I cook the mushipan in single-serve silicone cups so it can fit in my bento boxes. Finally, I get my added veggie fix with this easy carrot kinpira. I used to follow the recipe to the letter, but I had to stop because cooking this kinpira fills the house with the smell of sesame. But then I discovered I can get a similar result by steaming! For a single serving that will fit in a silicone cup, I use just two small carrots, peeled and julienned. I put that in the silicone cup that will go into my bento box for the day, then add a pinch each of dried red pepper flakes and sesame seeds. Then I drizzle a bit of soy sauce, toss it around to coat all the carrots with soy sauce and sesame seeds. I put the silicone cup into the steamer tray of the rice cooker and let it steam while my rice is cooking in the actual pot. It will be done by the time the rice is done cooking. Yes, that’s my keyboard you see in the background. I don’t have a lunch break, so I eat lunch at my workstation. This is also one of the reasons why I bring baon to work. It was a week of soba goodness! The nigiri-sushi in the upper portion are made using the mold that I bought recently. I’m not 100% satisfied with it because it used up an insane amount of rice for just a few pieces, and I needed to improvise on the strip of nori that goes around each piece. I made double-striped one on the right side with the leftover rice. I was also able to make thinner sushi (all of the ones under the double-striped piece) by using half a nori sheet and only one kind of filling. 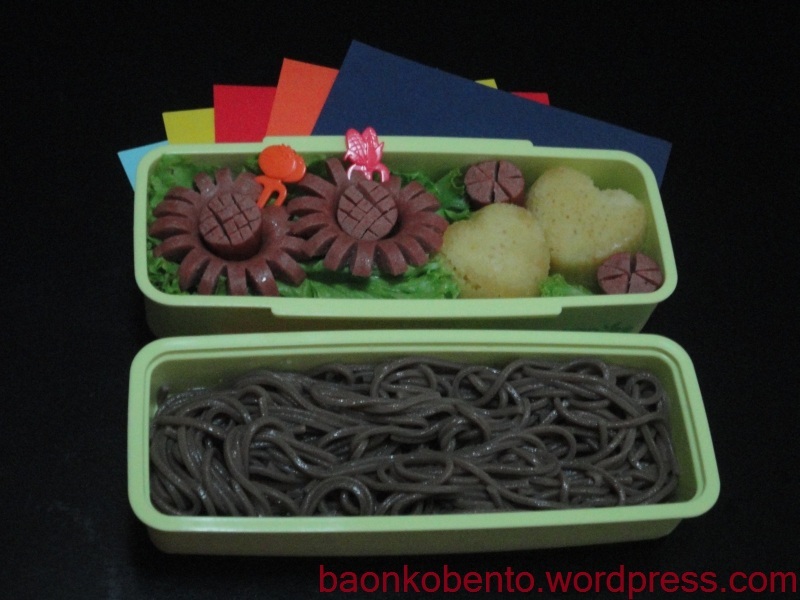 Here I made two sets, one with tamagoyaki inside (the yellow ones on the right) and one with kani inside (the ones at the bottom). 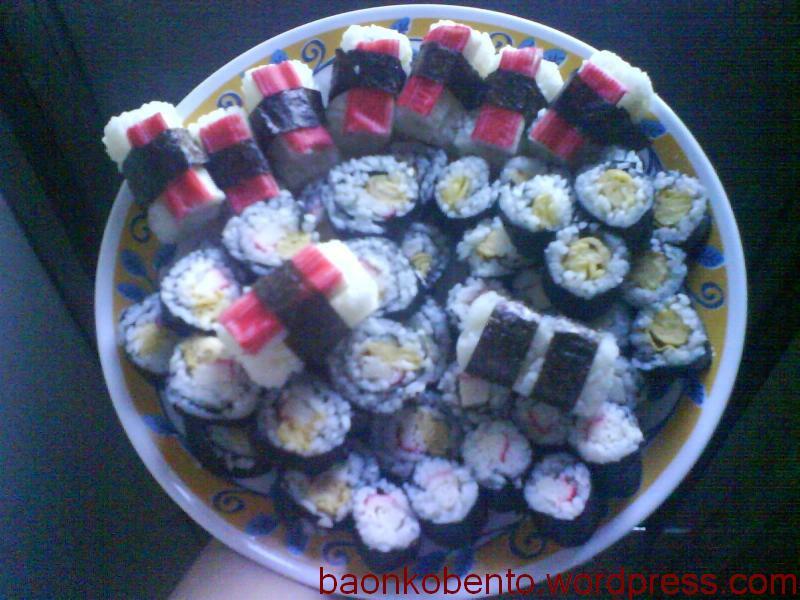 I also made two sets of the fat sushi I made before (the ones under the lone nigiri-sushi). Along with that plate of sushi, I made a huge batch of mushipan. 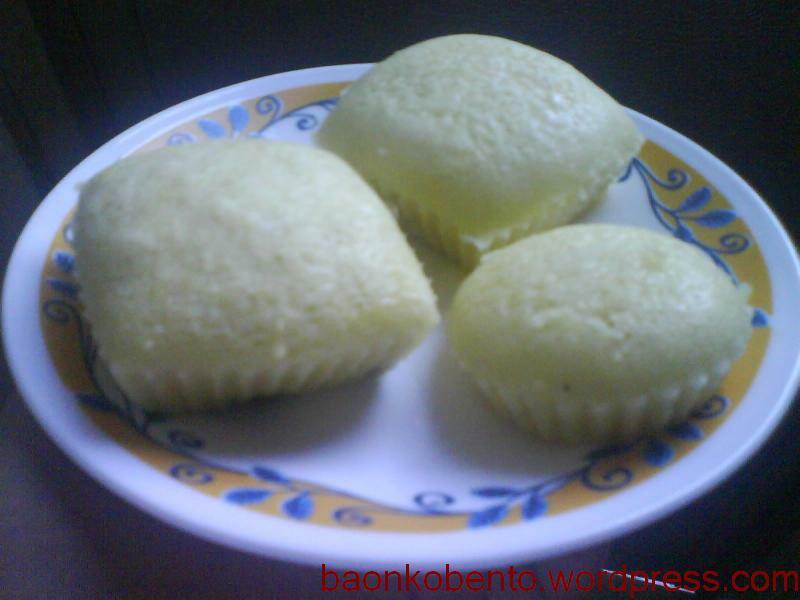 Mushipan are basically steamed bread-cakes that the Japanese eat as an afternoon snack (merienda). Usually it’s served hot with toppings like maple syrup, chocolate syrup, or even marmalade or jam. 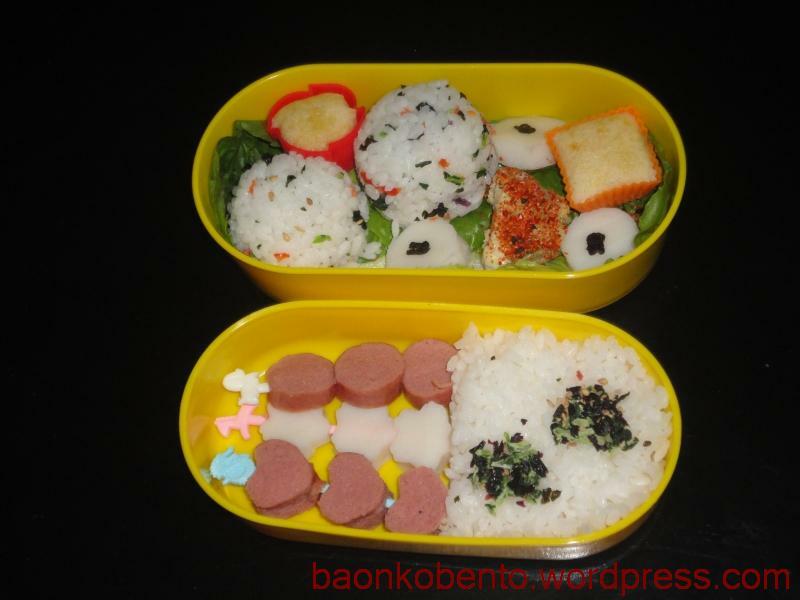 I’ve determined that it’s actually fine eaten cold and by itself and is perfect for bento. I made my mushipan using silicone cups instead of a colander as most steamed bread recipes use. The bigger square shaped ones are roughly twice as big as the small circular ones (because it used twice the amount of batter). I’m still in the process of finding the right sugar content; the original recipe called for a small amount and is almost bland. This batch I made had 1.5 cups more sugar, but still Gaeb says it could use a bit more. Tesla liked it, though.